Don't wait for St. Patrick's Day to serve this festive ice cream dessert recipe, because this treat is perfect year round. 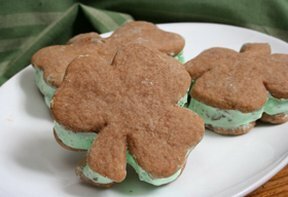 You'll love the mint chocolate chip ice cream sandwiched between the chocolaty shamrock-shaped cookies. You will find information on how corned beef is made and how to serve it. Also see the information on different types of cabbage.